Nickel silver tokens are made from a solid non-tarnishing shiny silver security metal that is less common than our brass tokens. 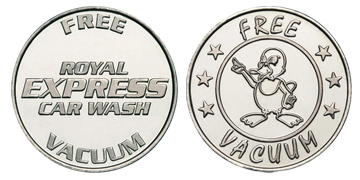 They work great in electronic coin mechanisms where you do not want to accept normal video game tokens. Nickel silver tokens are available as stock tokens and also through our Mix and Match program. A minimum Mix and Match order of 5,000 pieces is required.